Re-Vitalise is owned and run by Andy Spragg. With his Buddhist practise, Andy focuses his retreats on practises which support and have synergy with mindfulness. Re-Vitalise run retreats throughout the UK covering Tai Chi, Yoga and Buddhist meditation. Once a year Re-Vitalise come to Holy Isle for a 1 week course covering all 3 disciplines with a desire to convey the fundamental principles of T'ai Chi, Yoga and meditation. The programme will cover postures, breathing and relaxation techniques from Hatha Yoga, Qi Gong, partner exercises and the form from T'ai Chi and mindfulness and loving kindness meditations from the Buddhist approach to meditation. This will be a 7 day retreat that will gently exercise your body, relax you and perhaps spiritually test you a little. Imelda Maguire is a qualified instructor for the British Wheel of Yoga. She travels each year to India to study yoga in its traditional form. She is author of the best selling book "Yoga for a Healthy Body" and has been practicing yoga for over 35 years. She teaches all over the world and her classes are fun, dynamic, inspiring and easy to follow. She is a great believer in the benefits of yoga practice and runs seminars for health professionals, the NHS, Local Authorities and Schools. Andy Spragg has been practising Tai Chi, focussing on the Yang Tai Chi style (as taught by Cheng man Ch'ing), for 20 years. Andy Spragg is a practising Buddhist and his main focus is the synergy between Tai Chi and Buddhism, particularly Buddhist meditation. He uses his Tai Chi as a central part of his Buddhist practice. He also writes Buddhist articles which put across some of the more complex elements of Buddhist practice in a more accessible manner. He is determined to show that Buddhism can be practiced successfully in our modern, busy world. His teaching style is relaxed, light and informal. 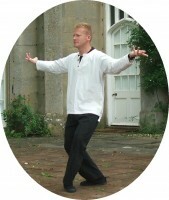 He focuses on the principles and feeling of Tai Chi rather than exact positioning. This is a more gentle approach to the usual and traditional focus on exact body positions and is very appropriate for beginners looking to experience the art for the first time but also for those looking to delve a little deeper. Previously, he practised other Chinese martial arts (Wing Chun) and also brings an understanding of the martial heritage of the art into his teaching. However, the focus for his teaching is on health, well-being and meditation.